Detail : Paul's sixth solo single. Credited to "Paul McCartney and Wings"
This incarnation featuring : Paul, Linda, Denny Laine, Henry McCullough and Denny Seiwell. 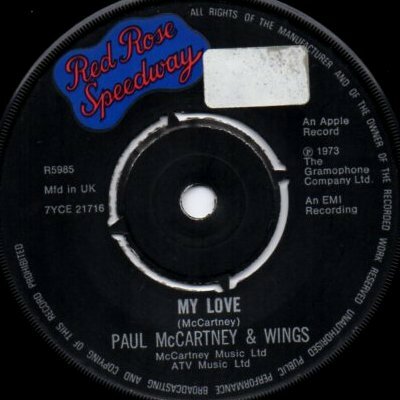 "My Love" was recorded during the Red Rose Speedway sessions, whereas The Mess is a live recording made on August 21st 1972 at the Congresgebouw, The Hague, Holland. The single was not released in a picture sleeve, but was issued in the UK in a red paper sleeve. The label was on a special Red Rose Speedway label and actually can be found with two variations. The first with "Paul McCartney & Wings", the second "McCartney's Wings". A mid-1970 re-issue removes the reference to Apple from the label and changes the publisher wording slightly.